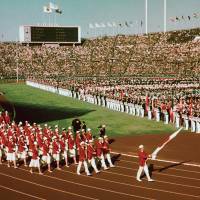 The 1964 Tokyo Olympics had a profound impact on the capital city and the nation. 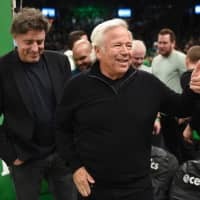 In the second installment of a five-part series that will run during the next two weeks, best-selling author Robert Whiting, who lived in Japan at the time, examines the excitement surrounding the Opening Ceremony. Finally, on Oct. 1, the putative crown jewel of the Olympic effort, the Japanese bullet train, started operations between Tokyo and Osaka. The shinkansen transported its passengers 515 km in about four hours, less than half the time it took before, reaching peak speeds of 210 kph to make it the fastest train in the world. The train followed the picturesque route of the old Tokaido Line, along the earthquake-prone Pacific Coast. The new Tokaido Line would become the busiest commuter corridor in the world, busier than even that which ran between New York and Washington. Train arrival and departure times were so reliable that people could set their watches by them and refunds were offered if trains were late. But not quite everything was finished. Yet to be completed was the fleet of mobile public toilets the government had ordered built at the last minute over the summer and spring, after some alert bureaucrat discovered there were not enough public restrooms in the original plans. Also unfinished were six of the planned expressways. Only two of the eight main expressways approved by the Tokyo Metropolitan Government in 1959 were fully completed, with two more only partially constructed. The elevated expressway from Roppongi to Shibuya was one of the incomplete projects. It remained unfinished for several more years. To solve the nagging problem of the guest room shortage, the government had to come up with last ditch measures whereby eight ships were anchored in Tokyo Bay to provide floating hotel rooms, while mountain resorts west of the city and urban Japanese inns were refurbished to meet Western standards. Incomplete though it was, enough of the infrastructure was in place to allow the games to begin. A full week before the Opening Ceremony, athletes began arriving at Haneda Airport — Russians via Aeroflot, the Americans via Pan Am, the British via BOAC — with press conferences arranged right on the tarmac. Along with them came the first waves of tourists. It was the first time in the history of Tokyo that this many gaikokujin (foreigners) from around the world had gathered there, with the exception of the early Occupation when several hundred thousand foreign soldiers were in the city — although these were almost all Americans and were not exactly what you would call welcome guests. Many Japanese appearing on man-in-the-street interviews said they were seeing gaijin for the first time in their lives. The city that had newly emerged was almost unrecognizable compared to what it was when I first arrived. Construction had halted and everywhere you looked, you saw a gleaming, new building. There were flags all over the city honoring the 94 nations participating in the games — 7,000 of them said the papers, and each of them tended to by a Japanese Boy Scout. Menacing yakuza had virtually vanished from the streets. At the request of the government, gang bosses had ordered “unpleasant looking” mobsters in their ranks to leave the city for the duration of the games and undergo “spiritual training” in the mountains or seashore. 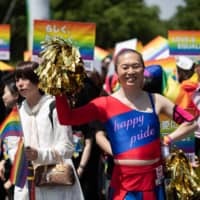 The beggars and vagrants who had occupied Ueno Park and other parts of the city, had also magically disappeared, as had the streetwalkers who normally populated the entertainment areas. As an added bonus, the city’s 27,000 taxi drivers had been persuaded by the authorities to stop honking their horns, all in the interests of making Tokyo sound as sedately refined as a temple garden hung with wind chimes. 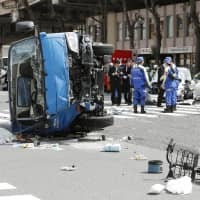 At many intersections, there were containers of yellow flags, put there at the pedestrian’s disposal by the governor’s office, for use in safe passage across the street, a necessity given the humongous traffic jams that clogged Tokyo’s main avenues. The citizens of Tokyo had been trained to accord the highest courtesy and hospitality to the athletes, officials, journalists and spectators who converged on the capital. Smiling interpreters, organized by the municipal government, roamed the city in special cars, searching for bewildered looking foreigners to help —and they were not hard to find. In Ginza, at the big shrines like Meiji Jingu and at the clubs in Akasaka, there was never a shortage of loud-talking foreign tourists anxiously poring over their guidebooks and maps, attempting to decipher Japan’s arcane chronologically based address system in which Building No. 2 might be next to Building No. 1, but might also be next to Building No. 19, quite evidently in need of assistance, which was readily forthcoming and gratefully accepted. During that time, I found it nearly impossible to walk down a street in any of the main shopping and entertainment areas without being stopped by someone and asked if I needed help finding my destination. Even when no volunteer raced up to offer you guidance, it was still nigh impossible for the foreign visitor to get lost. No matter where you were, on the sidewalk, at the train station, in Japan’s labyrinthian underground pedestrian walkways, there were signs posted in English pointing the way. There were also signs in Japanese reminding the citizenry to be on its best behavior, along with others warning young girls not to be taken in by the lady-first etiquette practiced by foreign men. “Do not mistake this as an expression of love” said one which I remember with particular fondness. On Oct. 8, two days before the start of the games, as if ordained by the Shinto gods, a typhoon blew through Tokyo and washed away all the dirt and dust and air pollution, cleansing the city for the big event. The Opening Ceremony itself was a memorable event for a number of reasons, not the least of which was the fact that it was hosted by Emperor Hirohito, the man in whose name the attack on Pearl Harbor and the invasion of Southeast Asia were undertaken by the Japanese Imperial Army some 25 years earlier. In 1945, Gen. Douglas MacArthur had opted not to prosecute Hirohito, grandson of Emperor Meiji, for war crimes along with Japanese wartime Prime Minister Hideki Tojo and others, but rather keep him as a symbol, sans power, divinity renounced, of the new postwar pacifist country the Occupation sought to establish in Japan. Thus was the Emperor conveniently available to perform welcoming duties for the visiting athletes — not as the head of state as normally required by the IOC, but in his capacity as a “patron” of the 1964 Summer Olympics, to use the term determined by the Tokyo Olympic Organizing Committee with the assistance of the Ministry of Education. He stood there in a special box wearing a simple black suit, amidst the crowd of 75,000 people at the shiny new National Stadium — a thousand riot police guarding the grounds outside — as the athletes marched in: Americans in their big cowboy hats, Indians in purple turbans, Ghanaians in saffron robes, and the Japanese contingent, coming in last, in red blazers and white slacks or skirts, carrying the Hinomaru (national flag), which was, along with the Emperor, another symbol of Japan’s Imperial past. Trumpets blared, cannons roared and the Japan Self-Defense Force’s aerobatic skywriting demonstration team Blue Impulse traced the five rings of the Olympic symbol in the sky with their F-86 Sabre Jets (without the benefit, one might add, of an electronic guidance system for the pilots), while Yoshinori Sakai, a 19-year-old student-athlete born in Hiroshima just hours after the atomic bomb fell on the city (and dubbed in the press as the “Atomic Bomb Boy”), carried the Olympic torch up a flight of 179 steps to deposit it in a cauldron of oil — the five-ring Olympic logo on his white T-shirt set fashionably beneath the red ball logo of the Rising Sun. Takashi Ono, a Japanese gymnast, took the athletes oath on behalf of the 5,151 participating athletes— 4,473 men and 678 women. 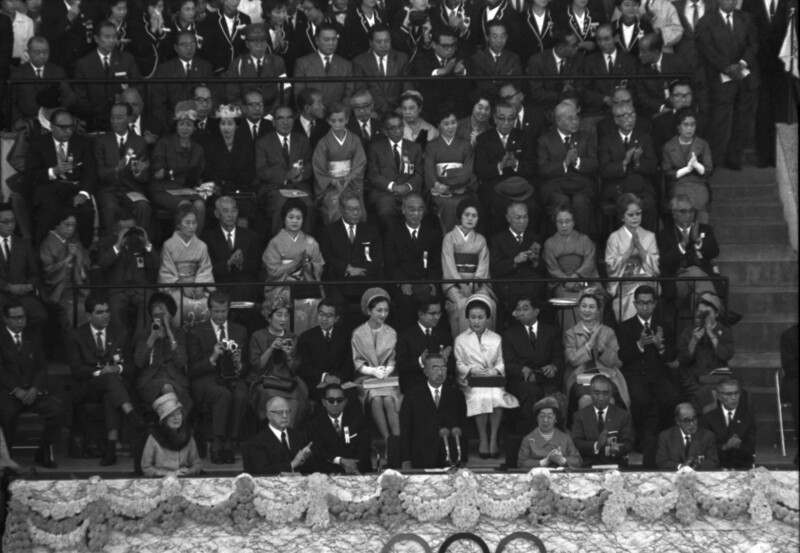 The broadcast of that Opening Ceremony, on Oct. 10, 1964, was watched by over 70 percent of the viewing public in Japan and was the first such Olympic event to be televised live internationally. It was transmitted to the United States using the American satellite Syncom III (the first geostationary communication satellite), and from there it was relayed on to Europe. 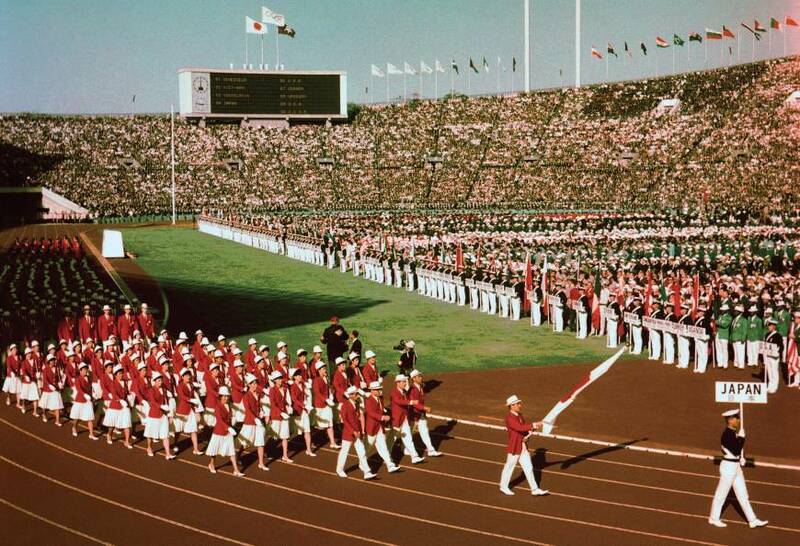 The Tokyo ceremony was also the first to be telecast in living color. That fact ignited a huge boom in the sale of color television sets in Japan in the run-up to opening day. The games also saw the introduction of slow-motion replay. I watched the Opening Ceremony at Dr. Sato’s luxurious new Western-style Harajuku apartment, on the seventh floor of a brand new 10-story residential building that had just opened up, one of the most desired spots in the city. The National Stadium was visible from the bay window in the living room, which was the size of a hotel lobby. Present were the doctor’s wife, his two pre-school daughters and two Japanese movie actresses. We sat on expensive leather couches in front of an enormous Toshiba color television eating foie gras and drinking Napoleon brandy. What I remember most about that day was the aura of pride that pervaded the room; my hosts and their other guests were bursting with it. It was in their misty-eyed faces, if not in their otherwise mostly restrained reactions to the on-screen ceremony. For them, for the whole of Japan, it was plain to see that this was a transformational moment. I was already enamored of the country and in my own way I shared in the emotion, but at the same time, a little voice inside me was starting to make its presence felt. They were suitably impressed, which was of course the doctor’s intention. (It should be noted that while the term “best friend” was imported in vivo into the Japanese language, the range of its usage was considerably broadened in the transfer. At a time when 10-year-old American children were being asked to serve as language tutors, for a grown-up native speaker it was not hard to find offers of best friendship, even under the most casual circumstances. In addition to his Ginza clinic he was building his own hospital outside Shinjuku. He was in the top 1 percent in terms of income. He traveled around the city in a chauffeur-driven Lincoln Continental limousine, dressed in expensively tailored English suits, and, as we have seen, spent his evenings in plush Ginza night clubs. He was comfortable spending more money in one day than most Japanese salarymen did in a year. Ordinary Japanese company workers that I had gotten to know could not imagine the doctor’s lifestyle. They commuted for an hour or more each way on uncomfortably packed trains, worked 12-hour days, drank cheap Nikka whiskey at discount stand bars in the entertainment hubs and had one suit that they wore daily until it was shiny, pressing it by laying it out under the futon each night in their small and often gloomy apartments that were little better than hovels. But, as I came to understand, they shared in certain common beliefs. These might be summarized as follows. The war had been bad, but Japan was not entirely to blame for it. Japan had done a noble thing in attempting to throw off the white man’s yoke in Asia. Japan’s wrongdoings in war were no worse than those of other countries. They had hated the idea of foreigners occupying Japan, and as a Confucian nation had mixed feelings about the Western-style constitution that had been imposed on them by the Americans. They were on a collective mission to restore Japan’s face in the world and hosting the Olympics was the first big step. The pride they felt in that achievement was beyond description. I had gotten to know a Mitsubishi Heavy Industries employee named Suzuki. He was an architect, a short, quiet, bespectacled 32-year-old graduate of the University of Tokyo and father of three, who designed giant oil tankers. He worked punishing 70-hour weeks and lived in a cramped apartment complex with no central heating. Mr. Suzuki told me he had been offered a position in Sweden, working for a Swedish ship company, at several multiples of his modest salary at Mitsubishi, plus a big house outside Stockholm, plus a chauffeured car. I was more than a little surprised when he told me he was going to turn it down. “How could I possibly betray my company and my coworkers by moving to Stockholm?” he said. Leaving Mitsubishi was unthinkable, Mr. Suzuki explained. Leaving Mitsubishi for a foreign competitor was even more unthinkable, he added, no matter how much money they offered. He was Japanese. He simply couldn’t do something like that. We all tend to look at the way other people live and view it through our own set of values. I certainly wouldn’t have wanted to be a corporate warrior in Tokyo. Your life was simply not your own. Yet, I came to admire people like Mr. Suzuki and his coworkers for their dedication to their firms — and to their country. To many Japanese, that gritty all-consuming struggle out of the dust and the ashes was a kind of life fulfillment. There was a certain beauty in it. The next two weeks of Olympic events were almost anti-climactic, considering everything that had gone on before. But they were notable for a number of other firsts that would serve to promote the Japan brand. They were the first games in Olympic history that used computers to keep results, introducing new electronic timing devices, variations of which are still used today. Innovations included a new timing system for swimming which started the clock by the sound of the starter’s pistol and stopped it with touch pads, and a photo finish using an image with lines on it to determine the sprint results. Such advances thrust Japan into the forefront of global technological development. In all, Seiko Watch Corp., the official timekeeper of the games, and owner of the Hattori Building in Ginza 4-chome with the famous clock on top, unveiled 1,300 different Olympic timing devices, from nine different varieties of split-second stop watches to an electronic system that clocked swimmers to 1/1,000th of a second, memorized the individual lap times of up to nine swimmers simultaneously and printed out all scores on a sheet of paper the instant the race was over, thereby eliminating time-consuming human calculation. 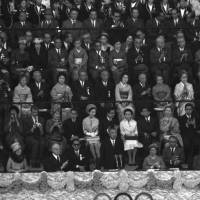 The 1964 Olympics marked the first time non-European timepieces were used. It put Seiko on the global map. Moreover, a major Hollywood film, the Cary Grant movie “Walk Don’t Run,” would be filmed in Tokyo during the Olympics, featuring the Hotel Okura, the British Embassy and other city’s sights as well as some of the events, including the 50-km walk, and shots of pedestrians crossing the street using the ubiquitous yellow flags. Finally, of the 2.1 million tickets printed for the games, 98 percent were sold, as compared with 46 percent in Rome in 1960. Some went on the black market at four times their face value. The Tokyo Metropolitan Government had 20 percent of its seats put aside for black-uniformed school kids, their places in the stands guaranteed by the Minister of Education. As for me, I could not get tickets to any of the glamor events, only a soccer game between Iran and Romania. I remember that the stadium was packed and very enthusiastic, although few in the stands had any serious rooting interest in either team. But just being in Tokyo and soaking up the atmosphere was enough. It was impossible to walk into any coffee shop, restaurant or bar without finding a new color TV set tuned to the NHK telecast of the games. More than once, I was mistaken for an Olympic athlete and asked which event I was participating in. “Beer drinking,” was my stock answer.